Some restaurants have a very beautiful entrance such as Sato-Besso located in Fukuoka in Japan. 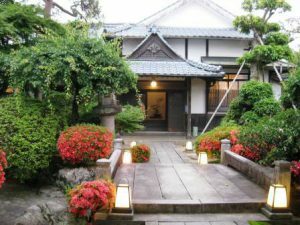 It is a restaurant known for making exclusive Kaiseki. Zoë has lectured and held sushi courses for A. P. Moller – Maersk, Hugo Boss Nordic, Novo Nordisk, Novartis, Velux, Gorrissen Federspiel, Beierholm revision, Elbek & Vejrup and many more.